I love Margaret Atwood. She is one of my top three favorite writers. That being said, I didn't love The Edible Woman as much as the other works of hers I have read. Of course the story was interesting and thick with irony and metaphor, but the "umph" that Atwood normally delivers was absent. This novel is heavy in feminist themes and for me, certain parts even recalled Ibsen's A Doll House. The Edible Woman follows the life of a newly engaged twenty-something, Marian McAlpin. Marian's daily life is surrounded a traditional, consumer society. As Marian struggles to gain control of both her life and her identity, she not only loses her ability to eat, she also feels that she herself is the one being consumed. She was becoming more and more irritated by her body's decision to reject certain foods. She had tried to reason with it, and accused it of having frivolous whims, had coaxed it and tempted it, but i was adamant; and if shes used force it rebelled. To be fair this was Atwood's first published novel so she was just warming up. I should also bear in mind that this novel was written in the 60's and it's themes were much more relevant and perhaps more risque than they are today. The concept of the novel is intriguing and had I not known what Atwood is capable of I probably would have liked The Edible Woman more. But for me, it took awhile for the story to get going and once it did, the denouement was a little lack-luster. It's tough to read a favorite author and their work is dated to our contemporary times so much that you can feel it. I agree that more than likely at the time it was very ground-breaking, but it's tough to read it now! Brenna, I love Atwood's writing. I am married to a wonderful woman, and have two amazing adult daughters, so I am always quite keen to work hard to understand the feminine side of humanity, and Atwood is just one of the tools I use. She is an incredibly insightful author, and I have gotten something out of everything she's written. Interestingly enough, this is one of her novels I've not yet read. I shall hunt it up and give it a go too. Cheers! Coffee, That's true. However, it is still worth a read! Christopher, You must be a great husband and a wonderful father. I look forward to your thoughts on this one. I love Atwood too. She's one of my favorite living writers. I haven't read all her books and this is one of them. Somehow, I was never attracted to its premise. 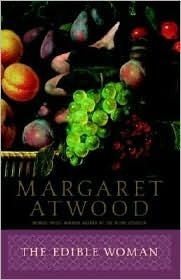 Atwood is one of my favorites too, though I haven't yet had a chance to read The Edible Woman. I do appreciate your honesty in this review - even though she's an author you love, you weren't afraid to admit that this novel didn't have that little extra something that makes all of her other work so great. Nonetheless, I still hope to read it and see what my own reaction will be because I do really like the concept. Thanks for sharing! First novels are often like this. They are OR burning rubber (Fight Club) OR just a training swing for the future (Ellroy's Brown Requiem). Writers usually get better with time. They are like wine. I agree about Atwood being an amazing writer. My favorite female writers along with Willa Cather. A very succinct review! I keep hearing all these great things about Atwood and I can hardly wait to finish some books on my TBR list before I add some Atwood. Love the cover of your copy by the way!! Mrs. B, I haven't read them all either. So far I've read 4. Working on it though! Laura, I do think every Atwood lover should read it! While it wasn't my favorite it is worth a read. Ben, That's kind of what I am starting to learn. Also, I really need to read some Willa Cather! Get "The Professor's House" It's the bomb. Thanks, Ben! I just added it to my TBR. Amen sistah! It seems like we were right in line with this one. historyofshe, We really were! I read your review when I was a couple chapters in and realized when I was almost finished I had the exact same thoughts as you! Wait a minute... I've figured it out. Did you buy this on Amazon? Maybe the word 'edible' brought up their suggestions of skinny and diet and stuff? Becky, Oryx and Crake is amazing I've yet to read The Year of the Flood. Soon though! Bethany, That would make sense but I didn't! Nor did I look at any Amazon reviews of the book! Who knows, but good thinking!